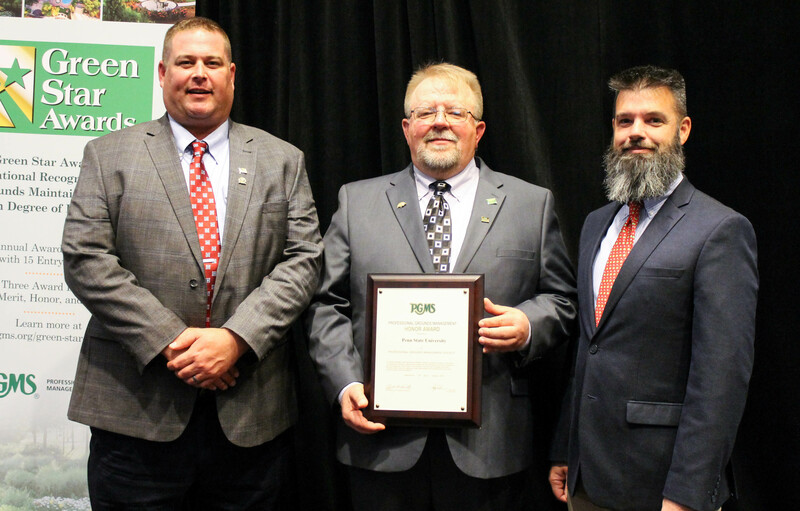 Penn State was recently recognized by The Professional Grounds Management Society (PGMS) for Grounds Management Excellence with an Honor Award in the PGMS’s Green Star Awards competition. The Green Star Awards program brings national recognition to grounds maintained with a high degree of excellence, complimenting other national landscape award programs that recognize outstanding landscape design and construction. The entire Penn State community is proud of their campus landscaping and facilities, and they continually strive to improve everything they do. The Grounds Department, like all departments on campus, are always trying to work on new ways to be more sustainable. In the past couple years, Penn State has been able to reduce their carbon footprint and at the same time, continue to improve their overall efficiency as well as their quality of landscaping. PGMS is an individual membership society of grounds professionals dedicated to advancing the grounds management profession through education and professional development.